It has a more refined edge. These are the thoughts of Yours Truly as I watch the S/S 2016 Public School show. Common has some thoughts, too, and shares them most eloquently. “That’s was incredible. Public School is one of my favorite artistic expressions. Their fashion line is what we want, man. It’s got everything we want in it." 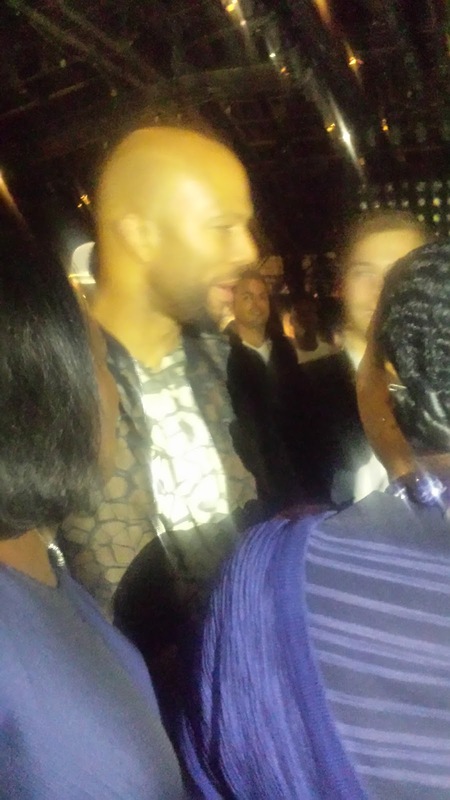 The swarm around Common after the Public School S/S 2016 show at Skylight at Moynihan Station. Photo by Yours Truly. Heretofore, Dao-Yi Chow and Maxwell Osborne have leaned heavily toward a street sensibility – an aesthetic with a more pronounced swagger. However, the black stripe gaia long coat has a sophistication that evokes an uptown vibe. Hugh Hefner might want to trade in his trademark pajamas for such a frock. Renee Elise Goldsberry (“Hamilton,” “One Life to Live”), fetching in a black, white and gray Public School sleeveless zip-front dress with pleated skirt has a favorite, too. “There was this one sheer jacket that had some embroidered flowers on the side. It was all sheer; it was absolutely beautiful.” (feather embroidered black crepe gaia jacket). The actress, who made her New York Fashion Week: The Shows debut at Public School (her first professional fashion show), added: “In general, I think the theme of the very loose, structured clothing inspired me.” (See video above). The collection, done in mainly black and white – a signature of the label – is an expression of self-possessed calm. No one will think you are trying too hard of you’re turned out in the chunky intarsia knit pullover and bonded kara skirt in off white. AMONG this year’s crop of designers (including Anna's Loud, Carmen Steffens and Alexandra Frida)showing under the Italy-based FTL Moda banner, the most notable is Wild. Barefoot models. Slowly walking down the runway. In a trancelike state. Various suede and shearling ensembles. Snatches of red satin. Engaging. All.